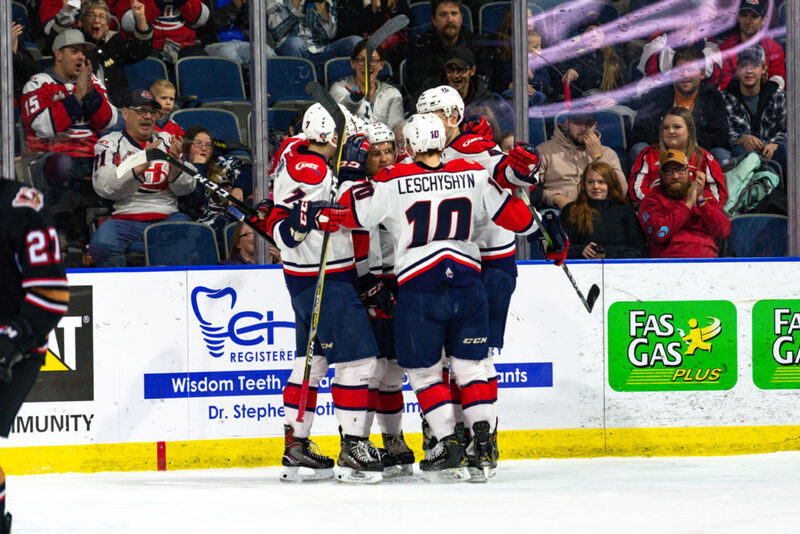 Lethbridge, AB – The Lethbridge Hurricanes played the final of a season-long six-game homestand on Wednesday night as they earned a convincing 6-2 victory over the Calgary Hitmen at the ENMAX Centre. The ‘Canes came out flying in the first period as they hemmed the Hitmen in their own zone. The Hurricanes opened the scoring as Jake Elmer snapped home his 23rd of the season on a two-on-one just 2:50 into the game. Jake Leschyshyn made it 2-0 on an unassisted goal for his 32nd of the season. Calgary cut the lead in half as Riley Stotts netted his 16th of the year to make it 2-1. Lethbridge struck while shorthanded as Elmer ripped home his second of the period for his 24th of the year chasing starting netminder Carl Stankowski as he was replaced by Taber product and Lethbridge Midget AAA Hurricanes goaltender Brayden Peters. The Hurricanes quickly got to Peters as Jordy Bellerive scored his 25th of the season off a face-off before Taylor Ross was able to stuff one home for his 26th as the Hurricanes led 5-1 after twenty minutes of play. The five goals was the most goals in a first period this season for the Hurricanes. The pace slowed in the second period as the Hitmen ramped up their game. Calgary outshot the Hurricanes 14-9 in the middle frame and would strike for the only goal in the period. Ryder Korczak out of the penalty box was able to move in on a breakaway and beat Carl Tetachuk to make it 5-2 for the Hurricanes. Lethbridge went 0/2 on the power play in the second period. In the third period, the Hurricanes would score the lone goal as Leschyshyn was able to stuff home his second goal of the game and 33rd of the season to make it 6-2. The Hurricanes continued to pepper Peters who stood tall the rest of the way as the ‘Canes earned the four-goal victory. Shots in the third period favoured the Hitmen 13-8 as they outshot the Hurricanes 38-33 in the game. Hurricanes went 0/4 on the power play while going a perfect 3/3 on the penalty kill. The win for the Hurricanes ends a three-game losing streak as they finish a six-game homestand with a 3-1-1-1 record. Lethbridge improves to 4-1-0-0 against Calgary as they’ve won four straight against the Hitmen. The ‘Canes improve to 28-16-5-5 on the season and remain third in the Central Division as they are now just one point back of the Medicine Hat Tigers for second and two points behind the Edmonton Oil Kings for first in the division. The Hurricanes travel to Swift Current to face the Broncos on Friday before returning to the ENMAX Centre on Saturday as they welcome the Saskatoon Blades at 7:00pm. Tickets can be purchased online at www.enmaxcentre.ca, by calling 403-329-SEAT (7328) or by visiting the ENMAX Centre Ticket Centre.